they mysteriously stiffen up as you sleep? an average of 79% of women and 53% of men. you through until the wee hours of the morning. to discover how to be more comfortable in the morning. taking a bath or shower, you can try knee bends. support, such as the counter, table, or a chair. specific abilities before trying these stretches. has good fat and polyphenols). In addition to olive oil, there are many antioxidant-rich foods. carotene, beta cryptoxanthin, quercetin, and anthocyanidins. apples, peppers and purple and blue fruits and vegetables. Bauer also emphasizes that there are foods you should avoid. (sugary foods, white flour, rice, bread), should be off the list. little weight loss goes a long way. increased stress across your knees and hips.” Yikes. also a generally good analgesic, regardless of your joint issues. take it in 250-500 milligram turmeric capsules. medications, to make turmeric is safe for you. pain in women suffering from knee osteoarthritis. 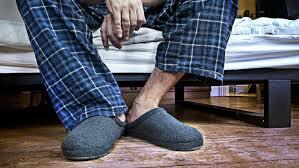 Joint pain may be caused by your sleeping conditions. turn up the thermostat a notch or two.